On Friday 14th December the Scottish Branch will be delighted to welcome Douglas McGowan MBE as he delivers a talk sharing his earliest steamer memories and his involvement in a campaign to save PS Caledonia in a festive joint meeting with the West Highland Steamer Club. The meeting is open to the public and will start at 7:30pm in Renfield St Stephen's Centre, 260 Bath St, Glasgow G2 4JP. In addition to Douglas giving a presentation there will be the latest news on Maid of the Loch and Waverley. Douglas joined the PSPS in 1966 as a Life member and has been active in the Society ever since, indeed it was Douglas who founded the Scottish Branch of the Society in 1969. He has been Chairman and Secretary of the Branch as well has National Chairman - twice. However, he is better known for the part he played in purchasing Waverley for £1 and returning her to service in 1975. 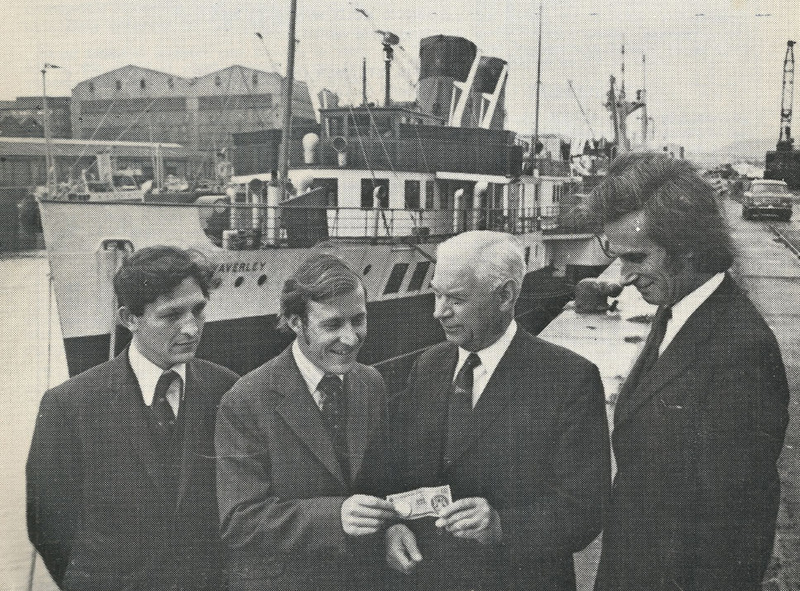 Waverley becomes the property of her own Company as Douglas McGowan (2nd left) hands over the £1 note as Terry Sylvester (far left) looks on. 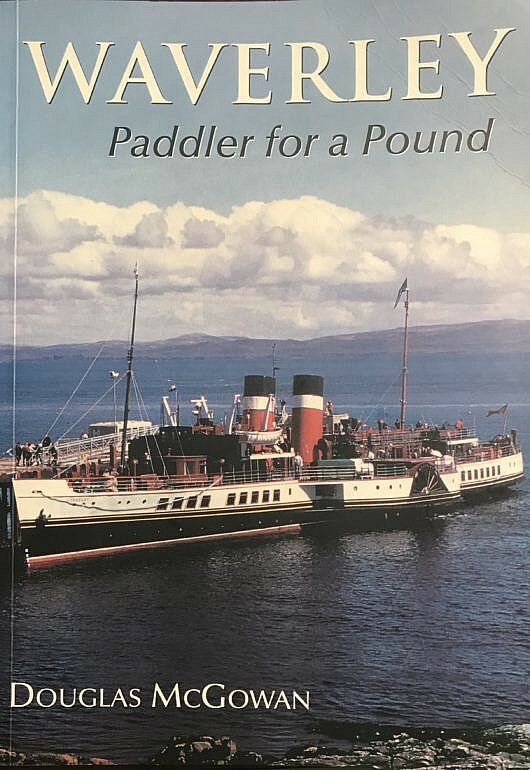 In giving his presentation Douglas will recall his involvement with a campaign to preserve the Clyde Paddle Steamer Caledonia which was withdrawn from service in 1969. 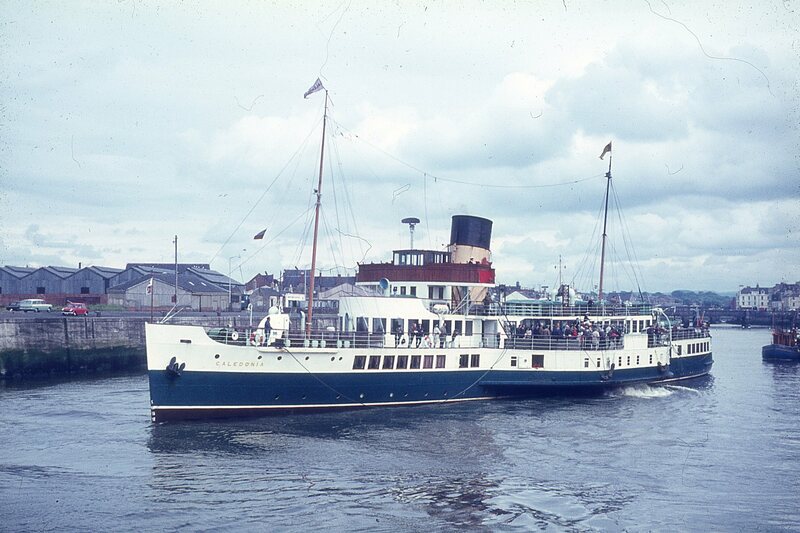 It was only two weeks after the PSPS Scottish Branch was formed that Douglas and other PSPS members produced a business plan to buy the Caledonia with the intention of operating her - Douglas certainly hit the ground running. Unfortunately the attempt to preserve and operate Caledonia didn't come to anything as her owners (Caledonian Steam Packet Co.) wouldn't sell the ship to a third party who were planning to operate her. However, the failed attempt to save Caledonia had brought like minded PSPS members together and in particular Douglas had formed a lasting friendship with Terry Sylvester. In his book 'Paddler for a Pound', Douglas describes meeting Terry and states "from that first day we met, our mutual thoughts, ambitions, and aspirations seemed to run on a parallel course". 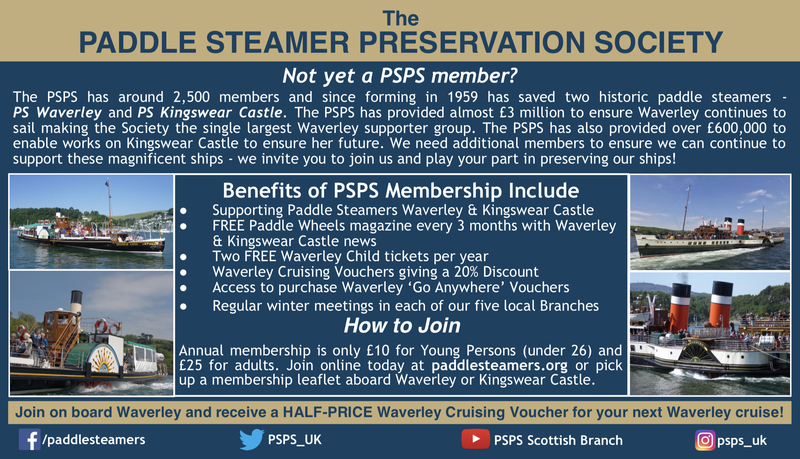 The PSPS formed a Waverley Study Group in 1970 led by Terry and Douglas which sought to advise and assist Waverley's operators to make Waverley different and increase her appeal. Terry and Douglas had regular meetings with John Whittle, General Manager of CSP who later became Chief Executive of CalMac. It was John who asked Douglas to attend a meeting in November 1973 to be told Waverley was to be sold to the PSPS for £1! Douglas along with Terry and Peter Reid then founded Waverley Steam Navigation Co to own the paddler - the three founding directors still remain individual shareholders today. 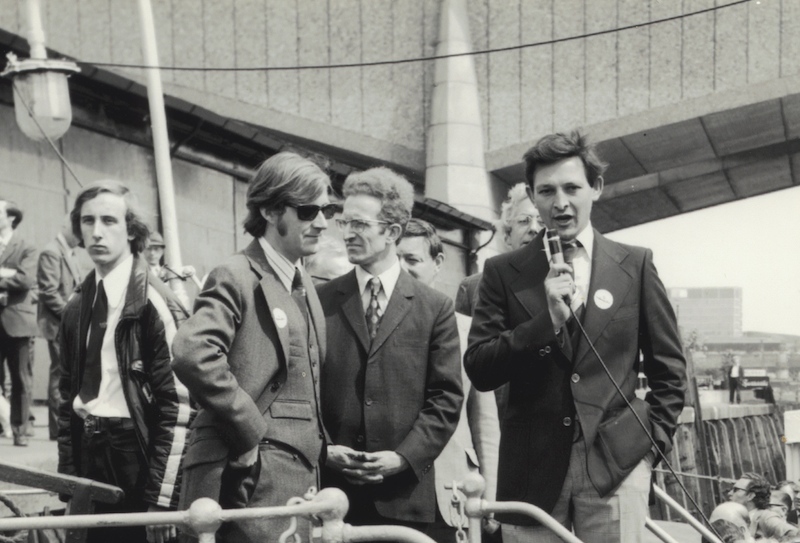 The three founding directors of Waverley Steam Navigation Co (Douglas McGowan - 2nd from the left with sun glasses, Peter Reid - centre, and Terry Sylvester - holding the microphone) all stand on the paddlebox platform before Waverley left Glasgow on 22nd May 1975. 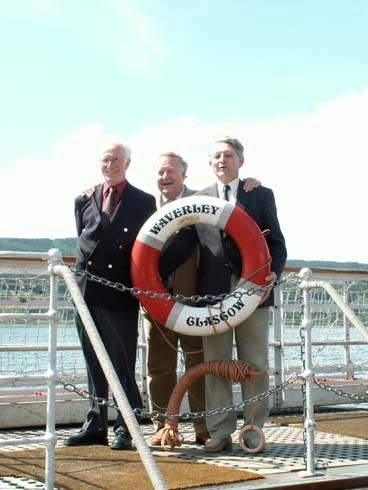 Peter Reid (left), Douglas McGowan (centre) and Terry Sylvester (right) all gather on Waverley's paddlebox platform in May 2005 to mark the 30th anniversary since Waverley first sailed in Preservation. Today Douglas is Scottish Branch Honorary President and Vice-President of the Society Nationally. 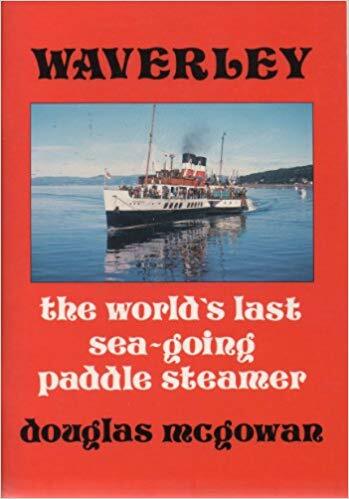 He has written and co-authored several books on Waverley including 'Paddler for a Pound' and 'Waverley The World's Last Sea-Going Paddle Steamer'. The story of how Douglas played his part in preserving Waverley is told in Paddler for a Pound. A souvenir book which was sold on Waverley during the early years of her preservation. Douglas was awarded an MBE in the 2017 New Year's Honours List for 'services to Waverley and charity'. 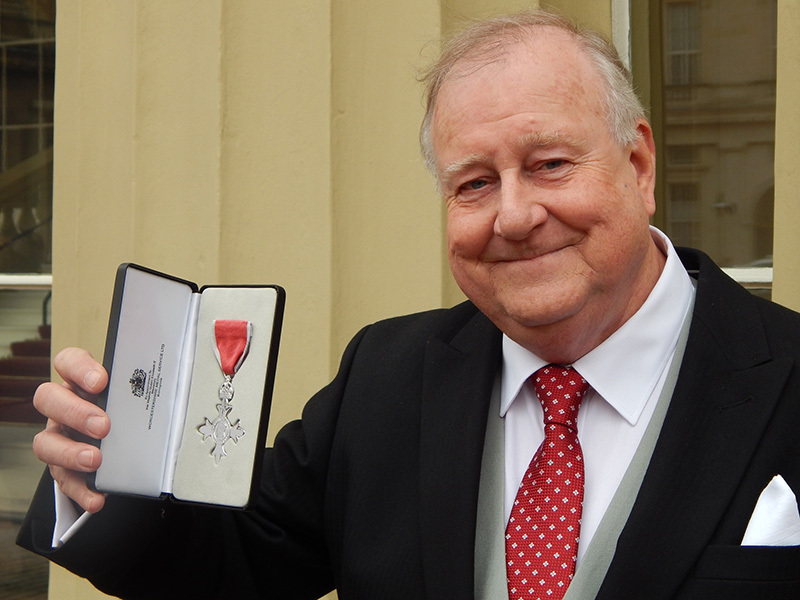 He received his MBE in March 2017 and acknowledged that the award was not just for himself but was for the small dedicated team who worked so hard to make it happen in 1974. Douglas having received his MBE at Buckingham Palace in 2017. The contribution Douglas has made towards the PSPS and Waverley's preservation has been simply outstanding. He is known to many PSPS members through his involvement with Waverley and the Scottish Branch looks forward to hearing from him as he delivers "McGowan's Memories". This meeting is open to the general public with no admission charge. The PSPS 2019 Calendar will also be on sale.